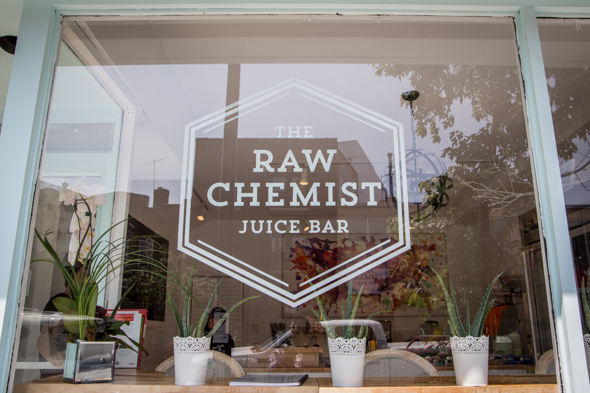 The Raw Chemist Juice Bar recently set up its first shop in the Junction , and judging by the comments from locals who stop in while I'm there, it's a welcome addition to the neighbourhood. "My friend and I shrieked when we walked by and saw you were open," one female customer tells owner Jessica Risi. Risi, seeming very much like a modern apothecary, recommends a shot of reishi and astragalus ($2.50) to the girl, who feels a cold coming on. It's a strong shot, Risi warns, but extremely effective. 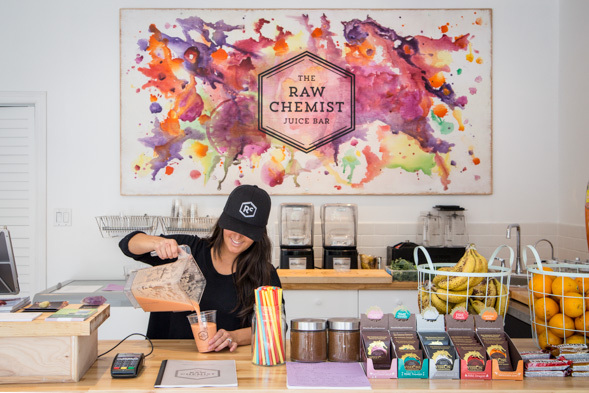 A visit to the juice bar is a pleasant all-around experience; the space looks modern and welcoming, with its appealing powder blue exterior, white honeycomb tiled floor and pots of aloe plants lined along the wooden ledge at the window. A splash of bright paints (courtesy of Kryart Studio ) across the back wall looks like an artful representation of the colourful juices on offer. 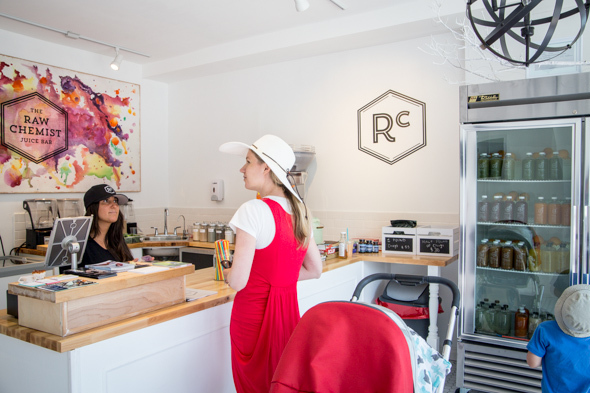 The process is simple: you come in, consult with Risi about your health woes and she'll recommend something to cure what ails you. There are currently nine different kinds of cold-pressed juice for sale (17 oz., $11 each), freshly made and bottled in the back daily. Unlike centrifugal juicers whose blades generate heat, the cold-pressed process doesn't disrupt the enzymes of the ingredients used, keeping more of the nutrients intact. "It's a lot more labour-intensive, but it's worthwhile," says Risi. At least 90 percent of her ingredients are organic and she buys from the local farmer's market whenever possible. 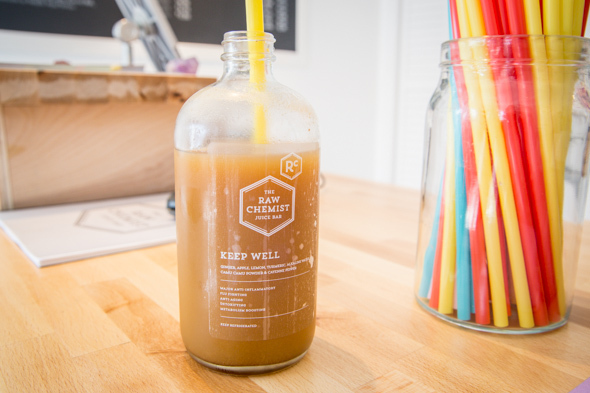 Keep Well, a cold-pressed combination of apple, alkaline water, ginger, lemon, camu camu , cayenne and turmeric, has been a popular item so far, as the flu has been going around this summer. Risi tells me this is a highly anti-inflammatory, anti-viral, anti-fungal, anti-bacterial, detoxifying drink. Of the nine made-to-order 16-oz. smoothies on the menu, I try the Strawberry Mango ($9). Along with the aforementioned fruits, it contains coconut milk and fresh orange juice. 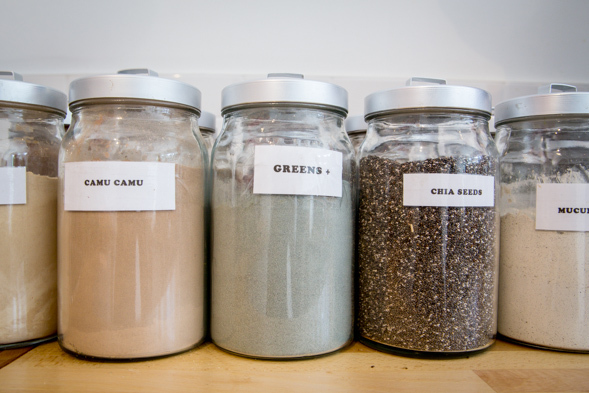 Risi also puts in some mucuna pruriens and maca powder , just two of the many possible boosters you can add to each drink for 50 cents to a dollar extra. 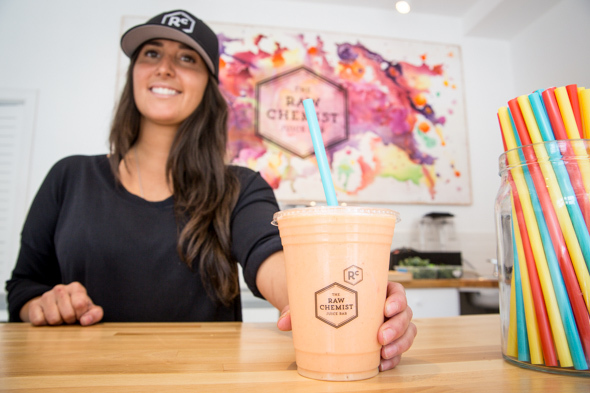 Risi is a fountain of information; her goal is to educate people about nutrition, and she plans on running seminars and bringing naturopathic doctors in to share their knowledge. I'm admittedly not the biggest health nut, but I'm won over and charmed by the whole visit.